We come today with a very important message. The next phase as you move towards the solstice will be one of deep growth and revelation. The energies will be pushing all of humanity forward and changing each of you deeply should you allow. You are being purged of all that is not in alignment, of all that stands in the way of merging with your soul. Never before has it been more important to love yourself completely to undo all the years of conditioning and beliefs that you have accumulated throughout your lifetimes. Your soul can not merge fully with a vessel full of self-doubt and self-hate. You must look at all the ways you do not honor yourself, the ways in which you sabotage or hold yourself back and the reasons you give to support this decision. What are the fears that surface when you think of putting yourself first? Of loving yourself completely without exception? What do you fear when you think of loving yourself in all the ways that you have wished to be loved throughout your life? Is it possible that you have a fear of what you will become? A fear of the power and connection that you sense deep within you? Understand that only through loving yourself is your full potential able to be unleashed. It is you who must determine what loving yourself completely looks like. For some the honoring of self will include exercise and a cleaner diet for others it will be allowing one’s self the rest needed to complete this transition with ease. For some it will be allowing yourself to take steps towards a dream, for others it can be drastic changes such as leaving employment or relationships that hinder your growth. What all must achieve on the journey towards self-love is the mastering of thoughts, of the quiet ways that one sabotages, berates, and belittles themselves. These must come to light, made fully conscious so that they can be changed moment by moment. Many fear that to put themselves first would be selfish. To this we say – Good! Be selfish! We know that once you allow yourself to be filled completely by self-love that you will also be filled with Source energy. For you see to love yourself completely is to love yourself as Source loves you. From this place of wonderful healing you will find yourself able to do and give more than you ever have before. Yet, you will also be filled with the gift of knowing that not all are ready to be helped and that to take on another’s burden may interfere with the intended lesson it was meant to teach. No longer will you feel taken for granted or taken advantage of, for your deep love of self will not allow it. You will also understand that by simply loving one’s self completely you become the example for others to do the same, helping to bring about radical shifts. When you fear that doing what is best for you and your growth is selfish, we ask: Where did you learned such a thing? Find the origin, unravel the truth and set yourself free. Allow yourself the freedom to grow and experience all this life has to offer without judging yourself or circumstances as good or bad. Trust and know that all is happening as it should, for your highest good at all times. See this all as a treasure hunt to find the most valuable prize, your true self. Know that we see you as perfect, whole and healed, we see your soul. It is time for you to see this as well. Me: I feel that on this journey I have been in this place before, where I have learned to love myself, but now I am seeing clearly ways that I am still not honoring myself. 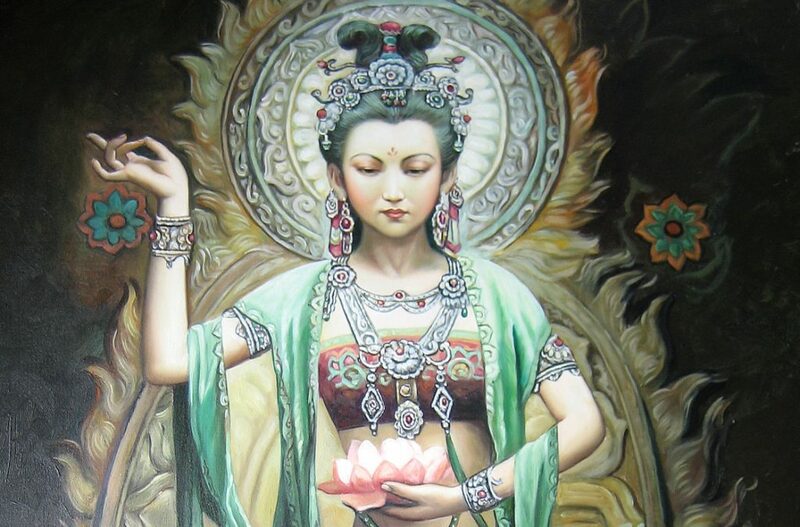 Quan Yin: Yes, you will find that as with all things of such magnitude that it happens in layers. In each moment you uncover more about yourself, your patterns, your conditioning, and the fears you carry. To revisit an issue previously thought healed is not an indication of failure, but of growth. Each of you will only be able to access what is ready to be seen and released. Me: My thoughts and perceptions of things are really becoming obvious. I was driving down the road when a rock flew up and cracked my windshield. My first thought was “Crap! I must have gotten out of the flow for this to happen.” But that didn’t feel right even as I was thinking it. Later that night I meditated and met with my team of guides and expressed my concern and was told “Being in the flow does not mean that things do not happen in your life. It is your reaction to these events that determines if you stay in the flow or not.” They went on to say that blame oneself for events deemed as unpleasant does more to remove you from the flow than anything. That to see error is to not understand that events happen as they should and all are intended to move you forward. So though I can’t “see” it, this inconvenience is helping me – maybe it was designed to show me where I was beating myself up. Quan Yin: Yes, this speaks to the thoughts that must be recognized and unraveled. It speaks to the deep trust that is needed to move through this process. Your soul is always working to provide you with opportunities to grow and reach your potential. To see all things in this light will help you to feel that you or another is to blame when things appear to go wrong. Me: This process seems to be speeding up, requiring more sleep and times of quiet. I have also had this interesting contradiction of feeling more connected yet moments of disconnection at the same time. Quan Yin: The disconnect you feel is simply the moments when you have moved forward, changed your frequency and the need to establish new footing. Grounding into the new reality helps to ease this transition. Purposeful connection with source energy, flooding your being with this will help as well.